Time for another new sketch for CAS(E) This Sketch. This week's sketch is by N@Ali. I went ultra graphic and used this distressed Impress sentiment and a shape from Paper Smooches. My son's birthday is coming up next month and it never hurts to have some masculine thank you cards on hand. I hope you'll play along this week - it's always so much fun to see how everyone interprets the sketch a little differently. Don't forget the deadline is next Tuesday at noon. Go check out our super-talented design team's submissions for some more inspiration! This will be my last CTS card as a member of the Design Team. It's been an honour to be a member of such a talented group of women, and I've had such a great time getting to know the other members of the Design Team and many of you participants! What a creative design for the sketch Ardyth! love the bold colors and fun arrows! I'll miss seeing your DT sketch creations! Super clean and simple card! Love the bold colours! I always look forward to your 'crisp, clean, and graphic' designs, Ardyth! 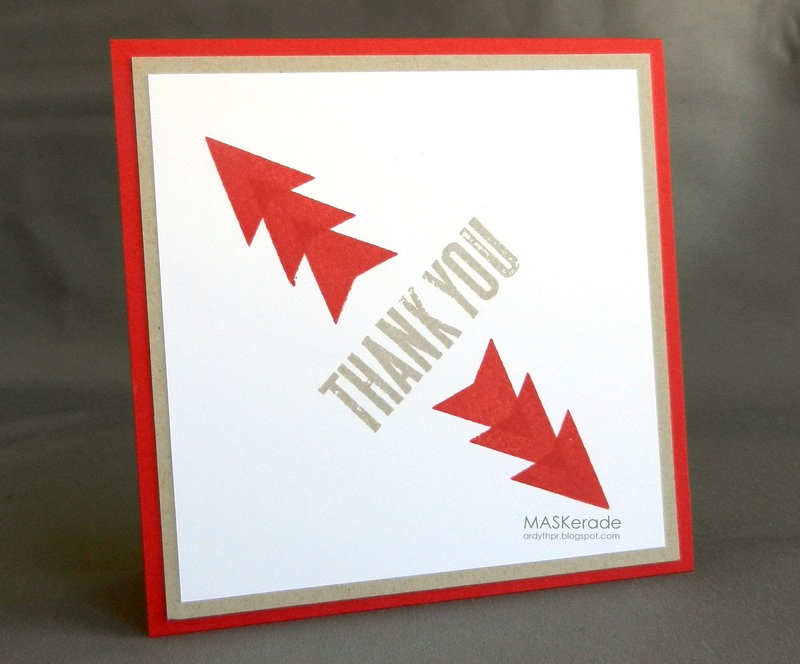 This card is fabulous...the bold red is amazing, and perfect for a thank you! I love your take on the sketch. The graphic quality is awesome! Sorry to see you leave CTS Ardyth. I have gotten to look forward to your creative cards and love your ideas! Another great card. I'll miss your inspiration for CTS but I'm sure you'll be entering your own designs. Ardyth, I love that you make square cards. And each one is so fun, you really have a way with paper and ink and this card is no exception. Love it. I'm crying here, it's been so wonderful to be inspired by you each week Ardyth (but lucky me I'm still with you at Muse)! Another great CAS graphic design today (I'm learning soo much)! ...gonna miss your amazing creations on this challenge blog! However, I'm sure that you are well in need of a bit of breathing room! Love the cool graphics that you created with the arrows! Truly the perfect guy card! Niiice ... those triple arrows you made are so striking! Good thing you're a daily blogger, or I'd be afraid we'd miss some of your work!! So wonderfully bold and graphic! I so love your style! I just love your amazing take on design, Ardyth! You always amaze me. I just found out you are leaving this group and will really MISS you...! I love your creativity and hope I will still see you in the other groups and challenges! !